1. Three pipes A, B and C can fill the tank in 9 hours. After working at it together for 4 hours and then C is closed, the remaining work is completed by A and B together in 7 ½ hours. Find the number of hours taken by C alone to fill the tank? C alone can fill the tank in 27 hours. 2. Four-ninth of a number is equal to five-sixth of another number. The sum of these two numbers is 92. Find the numbers? 3. P, Q and R started a business by investing in the ratio of 4: 7: 9. After 3 months, P invested Rs. 15000 more and after another 4 months R withdraws Rs. 8000. Find the share of Q, if the total profit at the end of the year is Rs. 229400? 4. A box contains 5 violet balls, 3 white balls, 4 green balls and 5 pink balls. If four balls are drawn out randomly, then the probability of getting a ball of different colours? 5. The difference between simple interest and compound interest on Rs. 75000 at the rate of 12 % per annum for 2 years is? Directions (Q. 6 - 10): Study the following information carefully and answer the given questions: The following bar graph shows the total number of passengers travelled in 6 different flights in a day from India in the year 2018. 6. If 39 % of the passengers from the flight P and R together is going to Venezuela and Columbia, then find the difference between the number of passengers from flight P and R together doesn’t go to the country of Venezuela and Columbia to that of total number of passengers from flight T? 7. Find the average number of passengers from all the given flights together? 8. 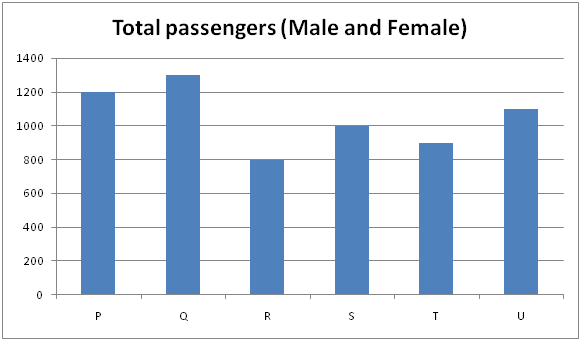 Find the ratio between the total number of male passengers to that of female passengers from flight Q and S together, if the ratio between male to that of female passengers from flight Q and S is 36: 29 and 27: 23 respectively? 9. Total number of passengers from flight P, R and T together is approximately what percentage of total number of passengers from flight Q, S and U together? 10. If in the year 2019, the number of passengers from all the given flights were increased 20 % each, then find the difference between the average number of passengers from flight P and S together in the year 2019 to that of the average number of passengers from flight Q and T together in the year 2019? 1) Three pipes A, B and C can fill the tank in 9 hours. After working at it together for 4 hours and then C is closed, the remaining work is completed by A and B together in 7 ½ hours. Find the number of hours taken by C alone to fill the tank? 2) Four-ninth of a number is equal to five-sixth of another number. The sum of these two numbers is 92. Find the numbers? 3) P, Q and R started a business by investing in the ratio of 4: 7: 9. After 3 months, P invested Rs. 15000 more and after another 4 months R withdraws Rs. 8000. Find the share of Q, if the total profit at the end of the year is Rs. 229400? 4) A box contains 5 violet balls, 3 white balls, 4 green balls and 5 pink balls. If four balls are drawn out randomly, then the probability of getting a ball of different colours? 5) The difference between simple interest and compound interest on Rs. 75000 at the rate of 12 % per annum for 2 years is? The following bar graph shows the total number of passengers travelled in 6 different flights in a day from India in the year 2018. 6) If 39 % of the passengers from the flight P and R together is going to Venezuela and Columbia, then find the difference between the number of passengers from flight P and R together doesn’t go to the country of Venezuela and Columbia to that of total number of passengers from flight T? 7) Find the average number of passengers from all the given flights together? 8) Find the ratio between the total number of male passengers to that of female passengers from flight Q and S together, if the ratio between male to that of female passengers from flight Q and S is 36: 29 and 27: 23 respectively? 9) Total number of passengers from flight P, R and T together is approximately what percentage of total number of passengers from flight Q, S and U together? 10) If in the year 2019, the number of passengers from all the given flights were increased 20 % each, then find the difference between the average number of passengers from flight P and S together in the year 2019 to that of the average number of passengers from flight Q and T together in the year 2019?